On April 10, 2019, Governor Doug Ducey (R) signed HB 2569 into law, allowing universal recognition of occupational licenses in Arizona. Arizona is the first state to recognize out-of-state licenses. Representative Warren Petersen (R) introduced the legislation in the House on February 4, 2019. The bill passed the House by a 36 to 24 vote on February 25th, and it passed the Senate on April 4th by 18 to 11 with one Senator not voting. Today, the Bureau of Labor Statistics released its monthly Employment Situation report for March 2019. Total nonfarm payroll employment increased by 196,000, beating expectations of 175,000 new jobs. Job gains occurred mostly in health care and in professional and technical services. Americans for Tax Reform (ATR) and the Center for Worker Freedom (CWF) strongly support the Fair and Open Competition Act. The Economic Report of the President was released on March 19th, 2019. The report shows a strong economy that is helping all Americans, particularly low-income Americans, secure jobs and higher salaries. On April 1, 2019, the Department of Labor issued a new proposed rule on joint employer. 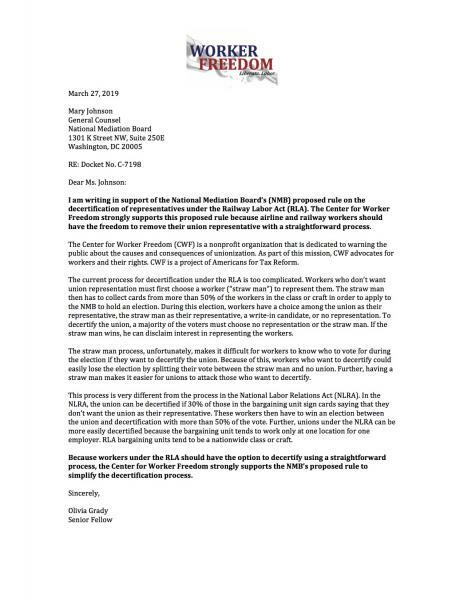 Today, the Center for Worker Freedom submitted comments in support of the National Mediation Board's proposed rule, which would simplify the decertification process. On March 7, 2019, the Department of Labor announced a Notice of Proposed Rulemaking on overtime pay. The Fair Labor Standards Act requires employers to pay employees time-and-a-half for the hours they work over 40 hours in a week. However, salaried employees who have a managerial role and earn a weekly salary above a salary set by the Department of Labor are exempt from this rule. The salary level currently is set at $455 per week or $23,660 annually. House Representatives will likely vote soon on the Paycheck Fairness Act (H.R. 7), which was introduced by Congresswoman Rosa DeLauro (D-Conn.) on January 30, 2019. Americans for Tax Reform and the Center for Worker Freedom urge Representatives to vote against the act. On February 7, 2019, Representative Alexandria Ocasio-Cortez (D-NY 14) released her Green New Deal outline. In it, she describes purported “crises” that Americans are experiencing from climate change, including life expectancy declining, greater systemic racial injustices, etc. On February 25, 2019, the Michigan Court of Claims dismissed a case challenging the repeal of Michigan’s prevailing wage law by the Michigan legislature. The court rejected the argument made by the plaintiff, Protect Michigan Jobs, that appropriations can’t be made in public acts. On February 14, 2019, Senator Rand Paul (R-KY) reintroduced the National Right-to-Work Act (S. 525). The Act would remove language from the National Labor Relations Act, which governs private sector workers, and the Railway Labor Act, which affects airline and railroad employees. Union leaders of the West Virginia Education Association, American Federation of Teachers – West Virginia, and West Virginia School Service Personnel Association announced a strike on February 18, 2019. Yesterday, schools in 54 out of 55 counties in West Virginia were closed due to the strike.